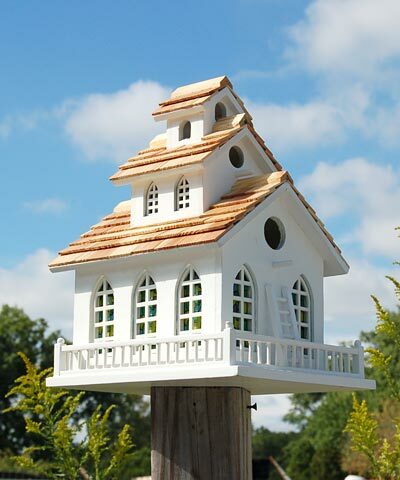 Bring a heavenly look to your backyard with the Home Bazaar Chapel Bell Bird House. The recognizable shape and bold details on this piece lend a delightful look to your yard, sure to inspire all visitors to the area. The three tiers on this roost bring height to it, while gothic-style, pointed window shapes on the first and second level enhance the chapel theme. Green, purple, yellow, and blue tones beneath each white window frame mimic stained glass, and pine shingles cover all three levels of the roof. A white railing surrounds the church, and a faux ladder leans against the front of the unit for a whimsical hint. The top level holds a working, metal bell to complete this wonderful abode. The first level has a 1.25" diameter entry hole, with a 0.75" long perch beneath it offering birds a landing spot. The tier above this one features a 0.75" diameter opening and another, 0.75" long perch, so the birds can reach the working bell at the top and ring it if desired. A bit of screen inside the home sits beneath the lower entry, forming a ladder for fledglings and helping them reach this exit when ready. The tall shape and wooden body keep this roost ventilated, and drainage holes on the base ensure the nest remains dry. Remove the back panel seasonally to check the nest or clean the item, for use season after season. The flat base of the home can rest on a level surface, or can accommodate a mounting plate (not included) for placement on a pole or post. Add a sublime element to your bird sanctuary with this Chapel Bell Bird House. Openings: 1.25" dia. and 0.75" dia.